What to know: This movie is great the whole way through and does not disappoint. As a long time DC Comics fan, I love anything DC related. Now, if you combine DC Comics and animation, I'm sold. This movie is great the whole way through and does not disappoint. 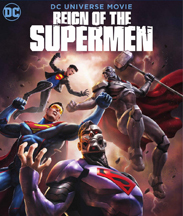 Reign of the Supermen is the sequel to the movie The Death of Superman (Oh yeah, by the way, spoiler alert...Superman dies in The Death of Superman). In the wake of Superman's death, four new would-be-heroes take on the Superman name and serve as replacements. However, these new "Supermen" must put their different views aside to work together to defeat a mysterious alien threat. First off, let's talk about the animation. While the animation looks nice, it feels kind of basic to me. The style is more realistic and so are the colors. The art style emulates the DC Comic style and I like that. I just feel the animation doesn't stand out as much as the story and writing. Speaking of story, I've watched quite a few of the DC animated movies and, while I like those films, I enjoyed the story in this movie more than any of the other films. This movie is more engrossing. There's something about the mystery of the alien threat and the new Supermen that I find really interesting. I also really like that Lois Lane actually is important to the plot. Even though Lois (Rebecca Romijn) is one of the most well-known DC characters, her entire character has been the damsel in distress since Superman first came out. And even though there are periods of time when she is a superhero, most of them are alternate universes and dreams and, one interpretation made her a hero because the writer of that specific story received accusations of using a misogynistic stereotype. Plus, no one talks about these interpretations. I didn't even know that she has been a superhero until I was researching her for this review. So it really feels like a breath of fresh air for her to be in the spotlight in a way that feels natural. Plus, I like how you can say that journalism is her super power, which makes her stand out. This movie is pretty funny. An issue that I have with the live action DC movies is that they tend to be too serious for their own good and, when they try comedy, it just doesn't work. However, I laughed a lot at this movie. All the characters are very lively and witty with clear personalities that work well off each other, especially Green Lantern. Kudos to the voice actors. I give this movie 4 out of 5 stars and recommend it for ages 13 to 18, and anyone who loves DC Comics. It comes out on digital on January 15, 2019 and on DVD January 29, 2019.